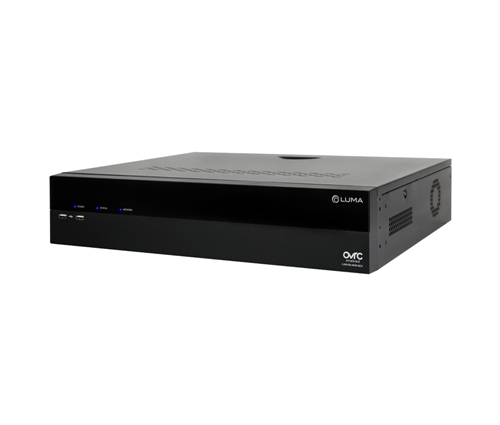 Luma’s 510 Series NVR offers powerful all-around performance and features, including support for higher resolution cameras up to 12MP, 4K TV output, Smart Search capabilities, and long-distance PoE. Its superior PoE capability enables you to create up to 250m runs from the NVR to a camera, as well as the ability to reset individual ports! For additional install convenience, use our free LumaLink remote access service to eliminate less secure port forwarding and DDNS setup, synchronize and manage your devices via OvrC, and so much more. Our lightning-fast, responsive user interface is popular with installers and end users alike. Rewind and fast forward, pause, take a snapshot, playback, and zoom to your heart’s content. All of these options are easily controlled with a tap or a swipe in our simple, clean UI. iOS or Android, Luma™ has you covered. Our Luma app is built using the same intuitive user interface design, built for mobile devices so you can check on what matters, providing peace of mind – anytime, anywhere. The 510 Series also offers a “no-HDD” option to give you maximum flexibility on the job. Customize your recorder storage capacity however it makes sense for you and your client! The 510 Series NVRs support cutting-edge camera resolution, as demand for higher-res imaging continues to grow. Each recorder is compatible with cameras up to 12MP. Our dedicated drivers control the NVR’s on-screen GUI navigation through the HDMI output. All Luma recorders are compatible with Control 4, Crestron, RTI, g! & URC. Find smart motion events at any time – even after events have occurred. With Smart Search, users can now search for a line crossing or intrusion box event on video after it's already been recorded! Each event shows separately on the timeline, while the line cross or intrusion box are set at the time of search, depending on what you’re looking for. Mix and match Luma’s easy-to-use interface and user-friendly mobile app with Visualint’s intelligent video cameras to create the custom install you want. Both Luma and Visualint cameras work with any Luma recorder you choose, so you can optimize systems for both price and performance. To further enhance privacy and provide additional peace of mind, customers can now turn individual camera feeds on and off with the flick of a switch. Just send a simple command via control system to the individual camera, and it will black out the camera stream. It’s perfect for setting up Home and Away modes on indoor cameras, or for clients who don’t want to invite Big Brother to their next pool party. You can also enable privacy commands such as stop recording or email notifications for further customization. An included HDMI output allows you to hook up your recorder to a television to view any image from the live feed. Better output resolution allows you to maximize the benefits of any high megapixel cameras, eliminating potential hassle. Typical IP systems are no match for Luma’s 510 Series recorders. The 510 recorders feature new and improved PoE with a controllable remote reset function, plus a shockingly long transmission range up to 250m. Setup is easy with our Luma utility. Featuring large, easy-to-find icons, access the utility on your PC and view the NVR User Interface through your web browser. You can also use LumaLink to offer a secure, fast setup without DDNS or traditional port forwarding. Note: Also compatible with Macs operating on version 11 and earlier. Manage all your Luma devices under your OvrC account. Our convenient P2P service, LumaLink, offers faster setup and is more secure than traditional port forwarding and DDNS. Using LumaLink, you can also sync your P2P-enabled devices between OvrC and the Luma app. Our 510 NVRs operate using the H.265 video codec. This updated codec uses roughly 40% less data than H.264, achieving the same footage quality while nearly doubling the efficiency of your recorder’s hard drive storage space. Please note: in most IP systems, encoding happens on the camera, so any connected camera must support H.265 to use this feature. Our sleek NVRs mount easily in popular racks, so you can keep cables or connected devices neat and tucked out of the way. 17.5" x 3.6" x 13.5"
Yes. Note: This product is 13.5" deep. OSD & Control Interface Desc. Luma Surveillance™ NVRs have a 3-Year Limited Warranty. The warranty includes parts and labor repairs on all components found to be defective in material or workmanship under normal conditions of use. This warranty shall not apply to products that have been abused, modified, disassembled, or improperly installed. Products to be repaired under this warranty must be returned to SnapAV or a designated service center with prior notification and an assigned return authorization number (RA). WARNING: This product can expose you to chemicals including Cadmium, which is known to the State of California to cause cancer, and Phthalates, which is known to the State of California to cause birth defects or other reproductive harm. For more information go to www.P65Warnings.ca.gov.